This wonderful spell was posted by Silver in the comments section of my spell titled: Another Sugar Love Spell. Thank you silver for sharing this lovely spell for us all to share and try! I do think you should be careful if you decide to pour the perfume over the picture but I guess you guys will just have to try it and see if it works! If this great sugar love spell works for you come back and leave a comment down below. Also compete in this months contest! Write your name five times over your beloveds photo. If you can write this in red ink then please do so. Insert the the the fishing hooks through the photos. NOTE: Make sure you and your beloved photos ARE facing each other so he/she can’t see past your face. Place the photos into the jar and pour the love powder over the photos. Pour your perfume over the photos. 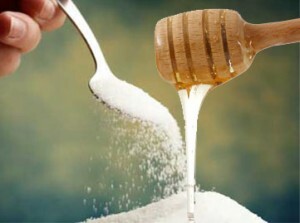 Pour honey and sugar over the photos to give it a boost! Seal the jar, ask the Lady Goddess to grant your wish and let her know that you mean no harm. Pray to her and thank her and make sure to be very clear when you tell her what you want. Place the jar in a dark place where it will not be disturbed or opened. and some white candles then you can really enhance the spells energy and effectiveness.